You can change the background of your banquet, just go to Options and tap on Change Background. You can rename the banquet name at any time. Just tap the options button and tap on Edit Banquet Name. You can reuse the existing design by saving it as a template. Just go to options and tap "Save as Template". Once saved, you can create banquets using the same design. The template does not contain seating assignments or invitees, only the layout design. You can add objects to your screen by tapping on the plus sign. You can choose between different tables (below is just a TEST picture), structural objects such as walls, ponds, swimming pools and other accessories such as Notes, Bar, DJ, cake table, projector, trees, etc. After adding an object, you can move it around the screen, you can notice it has a yellow frame around it. You can lock the object to a specific position by tapping the Lock button. The frame border will change from yellow to red. Some objects can be resized and rotated, the rotate and resize button will be enabled if the object is allowed to. For example, Tables cannot be resized and only rectangular tables can be rotated. You can copy any object by using the Clone option. Just select the object you want to copy and tap the Clone button. 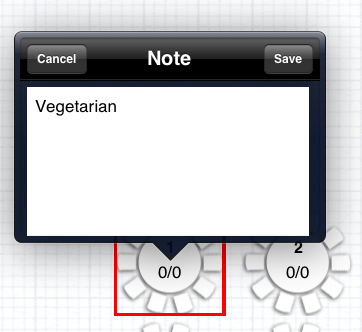 If the object is a table, the application will automatically assign the next available number to the table. 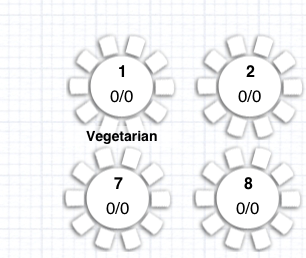 The Application automatically assigns the next number to the table. If you want to delete a table, the easiest way is to delete the last table. However, if you have to delete a table that can create a sequence gap, the next time you add a new table the application will fill this gap. The table also has two more indicators: Invitees Confirmed and Invitees Assigned. This way, you can easily tell which table is fully seated or which tables have pending confirmation. Before you can do your Seating Assignment, you have to create your Invitee List. You can either import all your Contact List, import invitees from previous banquets or pick them manually. Tap Invitee List at the bottom left corner of your screen. You can remove guests from this list by using the 'Delete' option. If a removed guest was already assigned to a table, they will be removed from there as well. You can also use this screen to do confirmations if you don't have guests confirming via Facebook. Just select a table and tap the 'Seating' button. A window will popover the selected table, here you add, remove assigments, you can also confirm the invitations. Depending on which type of table you selected (Table of 6, 8, 10, 12, etc), the application will make sure you don't exceed the its capacity. You can add guests by tapping on the plus icon which will bring up the Invitee List. Once you assign a guest to a table, you won't be able to assign him to another table within the same banquet. If you want to reassign the guest to a different table, just remove him from the current table and assign him to the new one. You can confirm an invitation by table or by name. If you know the table they are sitting at, tap the table, and tap the seating button. When the popover shows up, you can confirm his/her invitation by tapping on the "check", the "maybe" or the "x-symbol". The most common approach is to confirm by name. Just go Invitee List. This window will let you search by name or last name, it also tells you which table the guest has been assigned to. Same way, just tap on one of the icons (assisting, maybe, not assisting). If you entered the guest's email, you can request a confirmation by tapping on the email icon. You will be asked to Login to Facebook. Once logged in, if the Banquet is not linked to a Facebook Event, you will be asked to choose one. The application will remember you selection the next time you go to Facebook Connect. Once you picked the event, the window will show all the Invitees and their reservation status. If you picked the wrong event you can change it by tapping the 'Change Event' button. You can also refresh the list by tapping the 'Reload List' option. If a Contact is not found, please go back to the Main Screen and use the Contact Facebook Import to load the missing contacts. Tap on 'Sync RSVP' to update your Invitee List.